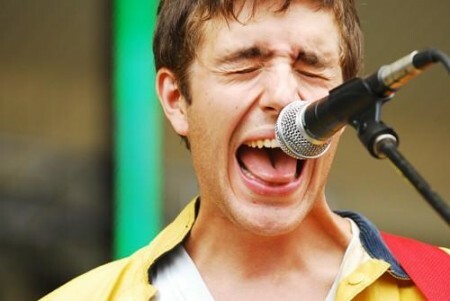 I tripped right into the gangly, urgent, danceable music of Ezra Furman & The Harpoons quite by accident last summer, and from the Jonathan Richmanesque spoken word lead-in of “I wrote this song in a paper bag…” my ears were happily perked. With a sound that channels some of the best awkward charm since the Violent Femmes, Furman has found an outlet for the restlessness of youth. Their music unfurls into cacophony and melody, retro and squawk, The Kinks meet punk, with a dash of The Replacements’ sloppy joy. There are handclaps and awkward yells and lyrics about enjoying the music without worrying ’bout the words. That sounds like a plan tonight when they hit Denver’s Hi-Dive for the explosive opening of their big autumn tour. That song makes me want to do some sort of modified twist dance move. It’s all in the hips. Ezra Furman & The Harpoons were signed by Minty Fresh Records while they were yet in college at Tufts, and are still evolving as a band through hundreds of live shows. I like where they are heading. Brian Deck (Modest Mouse) produced their album, and they played to an enthusiastic hometown crowd at Lollapalooza this summer. After two albums on Minty Fresh, their latest is a self-released effort wherein (get ready) Ezra will record a personalized song for each person that buys it . The purchasing instructions advise you to “fill out the information of who ever will be receiving this special album, be it you or for someone else. Things such as receiver’s name, where he or she lives, anything, really . . . seriously. Ezra and the band will revolve their special message around the information you give.” Did we use the word charming already? Let’s check ‘em out tonight. Tagged with ezra furman and the harpoons. How can you not love that? I don’t think it possible. It’s 5 in the AM and I can’t help but smirk all over myself. I saw them at SXSW2008 and Ezra is a bit awkward live. Not bad, though. I like it. Might have to spend some eMusic downloads on them.